Until April 2019 I was a Director of Research at AWS and the manager Amazon AI Labs. The Lab built cutting edge machine learning algorithms, systems, and services for AWS customers. We build parts of SageMaker, Kinesis, QuickSight, Amazon Elastic Search, Glue, Rekognition, DeepRacer, Personalize, Forecast, and other yet-to-be-released services from AWS. Before that I was a Senior Research Director at Yahoo and head of Yahoo's Research Lab in New York. We worked on building horizontal machine learning platforms and improving applications such as online advertising, search, security, media recommendation, email abuse prevention, and many more. I received my B.Sc in Physics and Computer Science from Tel Aviv University and my PhD in Computer Science from Yale University, under the supervision of Steven Zucker. After that, I was a Post-Doctoral fellow at Yale in the Program in Applied Mathematics. My personal research interests include fast dimensionality reduction, clustering, streaming and online algorithms, machine learning, and large scale numerical linear algebra. I am especially fond of randomized algorithms and high dimensional geometry. 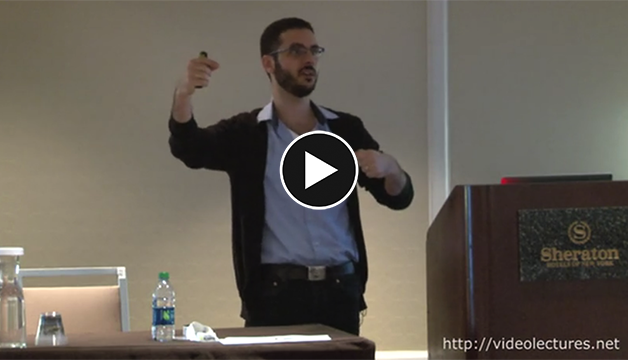 [Apr 2019] I gave a keynote streaming algorithms and the datasketches library at the Southern Data Science Conference. Thank you Khalifeh AlJadda for the opportunity and for putting together an outstanding conference. Kudos! [Feb 2019] I gave a keynote about coresets, discrepancy, and sketches in machine learning at ITA together with Dimitris Achlioptas, Ben Recht, and Chris Re. The slides are available here but the paper is yet unpublished. [Nov 2018] I am presenting SageMaker Algorithms at MLConf in San Francisco. I was told you can use the discounted registration link. [Oct 2018] I am presenting SageMaker Algorithms at the first ever Amazon Research day in Haifa. I want to thank Yoelle Maarek and Liane Lewin for organizing this awesome event. [Aug 2018] Presented an invited talk at KDD on deep learning on AWS and SageMaker Algorithms with Alex Smola. [Jun 2018] I recently visited the lovely city of Vienna where I gave two talks at the TMA conference. I talked at the TMA Experts Summit about SageMaker algorithm (presentation). Later, I gave a keynote and the TMA conference about data sketches and mergeble summaries (presentation). [Nov 2017] We just launched SageMaker!! I gave a talk about the distributed streaming algorithms we launched with it at re:Invent 2017. [Jun 2017] I just came back from Shonan in Japan from the Processing Big Data Streams workshop where I presented my work with Zohar Karnin and Kevin Lang on streaming quantiles. Vladimir Braverman, David Woodruff and Ke Yi did a wonderful job organizing it. [May 2017] Amazon posted a blog post called In the Research Spotlight in which they interview me about my career and current efforts in AWS. Frequent Directions: I have been asked to make some matrix sketching code available for a long time now. So, Mina Ghashami and I made some of our frequent direction git repo public. This code is distributed freely for academic use only. Please feel free to send pull requests. Streaming Quantiles in Python: I'm excited about resolving one of the longests standing open problems in the streaming model. We designed an optimal algorithm for finding any approximate quantile of a stream of elements. See also the paper which Zohar Karnin, Kevin Lang, and myself posted on Arxiv. The course covered algorithmic tools for data mining massive data sets. It was given as a theory/algorithms class with and emphasis on randomization. Edo Liberty, Zohar Karnin, Bing Xiang, Laurence Rouesnel, Baris Coskun, Ramesh Nallapati, Julio Delgado Mangas, Amir Sadoughi, Yury Astashonok, Piali Das, Can Balioglu, Saswata Chakravarty, Madhav Jha, Philip Gautier, Tim Januschowski, Valentin Flunkert, David Arpin, and Alex Smola. Professor Wenjian Yu of Tsinghua University pointed out that a the square was omitted from (1+eps) in equation 2. The proof is still correct after a straight forward correction. This will be corrected in the next version. Also, here is talk I gave at the Simons Institute about this. See also frequent direction git repo by Mina Ghashami and myself. Edo Liberty, Franco Woolfe, Per-Gunnar Martinsson, Vladimir Rokhlin, and Mark Tygert. Roni Ilan, Edo Liberty, Shahar Even-Dar Mandel, and Ron Lifshitz. Edo Liberty, Steven Zucker, Yosi Keller, Mauro M. Maggioni, Ronald R. Coifman, Frank Geshwind, and in collaboration with Plain Sight Systems. 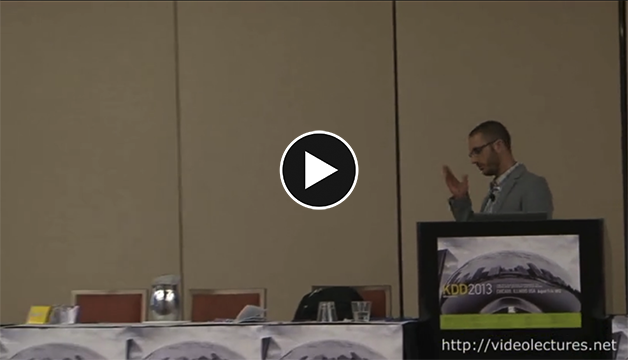 KDD 2012 tutorial on practical algorithms in mining streaming data; with Jelani Nelson. SODA 2011 and IAS and Yale math seminars 2011. 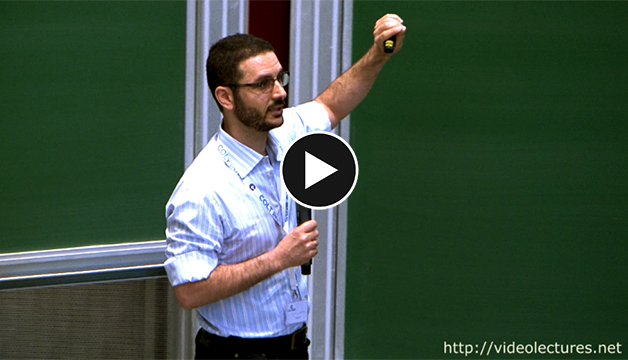 Video of the talk at IAS available here. Please don't ask me to review more papers for a while... I now serve as a PC for ESA, and SPC for WSDM and KDD.